Probably, every housewife has its own recipe of tasty cutlets. This dish, simple to prepare, loved by many. And the ingredients can be different: meat, fish, vegetables. 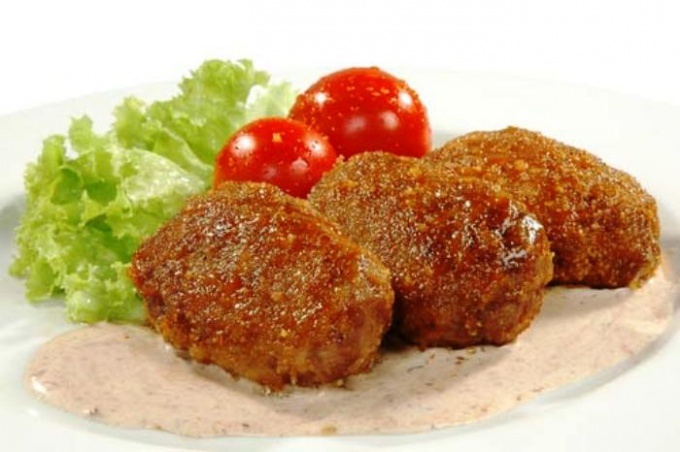 Very tasty rissoles of chicken. First wash the chicken legs. Then separate the meat from the bones. And it is possible to buy fillets of chicken legs. Then cut chicken into pieces and chop in a blender. Wash and clean the onion, garlic, potatoes. Chop the vegetables in a blender. Be careful they don't turn into puree. The vegetables just need to be properly shredded. Bread pieces put in milk. Give them a soak and wring out excess liquid. If this is not done, the bread will stick together and will be in the meat in the form of lumps. Combine together ground meat, potatoes, garlic, onion, bread. Add the egg. Add salt mixture. Add the pepper. If desired, you can use any mixture of spices for meat and chicken. Mix well the beef patties. Shaping the semi-finished products better with wet hands, soaking them in cold water. Roll each cutlet in breadcrumbs. Fry patties until cooked in a pan with sunflower oil. Cover the pot with a lid. The fire should be medium. The cutlets serve with any garnish: boiled potatoes, buckwheat. But it will be better and more useful to complement the burgers fresh salad. While cooking meatballs do not use high heat. Otherwise they will be raw inside and burnt outside. Serve the chicken cutlets to the hot table is better. To ensure that the dish looked spectacular, place patties on lettuce or thin pita bread. Next put a small cherry tomato, parsley.